Fresh out of the Ukraine, Nickbee has a varied and eclectic back catalog – His previous releases can be found on the Invisible, Dispatch & Horizons imprints among others. This versatile eastern european producer has already created a strong impression with his versatility and dedication, and this, his first release for Solace Records, only serves to reinforce that. The first track ‘Stars’ features catchy echo-laced percussion, subtle pads and warm textures. Zelda Marshall‘s vocals provide a compliment rather than a focus, and the result is an original sounding blend of authentic ethereal dubstep. Malk also features on production. ‘Breaking Her’ dives into even deeper territory with Marshall once again featuring on vocals. 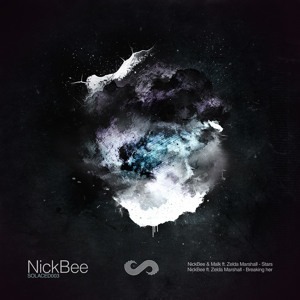 Nickbee‘s competent use of echoes and delay effects alongside the sparingly used vocal really demonstrate his skill as a producer on this track. The bass heavy 2-step beat clashes beautifully with the spaced out pads and effects and once again the result is nothing short of remarkable. This entry was posted in The Robot Recommends and tagged Malk, Nickbee, Solace Records, Zelda Marshall by 1nejack. Bookmark the permalink.